It was actually pretty good to my surprise and would say it’s mainly down to Josh Brolin’s fantastic portrayal of a young agent K. In Men in Black 3, Agents J (Will Smith) and K (Tommy Lee Jones) are back…in time. J has seen some inexplicable things in his 15 years with the Men in Black, but nothing, not even aliens, perplexes him as much as his wry, reticent partner. But when K’s life and the fate of the planet are put at stake, Agent J will have to travel back in time to put things right. Tim’s Film Reviews: I would recommend it just to see Josh Bolin’s Agent K impression. It’s not quite Men In Black 1 but it’s far better than Men In Black 2 and that will do for me. The weird thing for me was how bad Will Smith’s performance was considering he was normally the main comic relief figure in the previous films he didn’t do very well in this compared to other characters such as young agent K and Boris (the animal). I was surprised to learn that Boris was played by Flight of the Conchords (Jemaine Clement) whose performance as a Men In Black alien villain was fantastic and a joy to watch, sadly not quite as funny as Vincent D’Onofrio’s performance as the bug in MIB but that was iconic MIB comedy. My favourite scene would have to be between Boris arguing with his past self (really made me laugh) and the last scene that I won’t say what it is because it’s really spoilerish but it’s sad and good at the same time glad that its ending was as strong as it was. 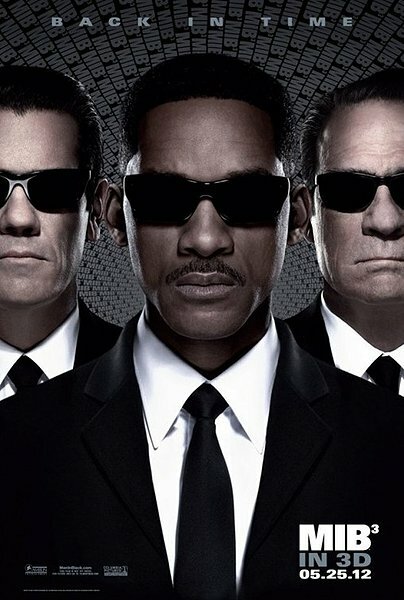 The best review “”Men in Black 3″ has got the MIB mojo back – well, most of it anyway”. Betsy Sharkey. What I like about this review is that it made me think why couldn’t they make another MIB series of films but set with Josh Brolin as main character set in his time with a new partner, I really think this would work set in the 60’s and if anybody has any thoughts on this please comment below I would love to hear your thoughts. Plus as much as I love Tommy Lee Jones he was looking very old in this film and Will Smith’s performance was just weak so bring on the next generation of MIB which would actually be an older generation, whatever you get what I mean. The flaws with this film mainly come from the weird kind of story that seems to come out of nowhere and at times seems to be very scattered but they manage to pull it off so it doesn’t ruin the film thankfully. I did find out why the story was a little all over the place, it turns out that the plot wasn’t actually finished when filming started and was a bit like someone writing scripts and plot as they were filming which obviously would be difficult to get right but it seemed to work ok in the end. Going to end on a good note, I loved the little hints of the talking pug in this film notably the giant photo in agent k’s room and the circus poster with the caption the amazing talking dog which was a nice touch. I haven’t seen the film yet, Tim. However, I can easily say that Brolin does the best TLJ impersonation I have ever heard. You’re welcome. I appreciate the thank you. I try to do that with anyone who comments on my posts. Sometimes I forget, but the appreciation is always there. Thanks, bro!! Great review, this seems like the definition of a fun time. Good review Tim. I had a good time with this movie, mainly because it reminded me a lot of my fond memories from the first one. Also great to see Will Smith back up on-screen having such a damn great time. Totally agree that Will didn’t shine like in the first two movie. But I don’t think it was his lack of performance. I honestly believe he was outshined by Brolin, who did a magnificent job as the younger Agent K.
I didn’t really like Boris. My favorite character in this film was Griffin. I hope to see more of him in the next installment.